For 2014, Pearl has reintroduced a full line of SensiTone snare drums, complete with a couple of interesting upgrades. Over the years, the SensiTone name has been associated with solid, workhorse snare drums for the budget-conscious drummer, so it is very good news to hear that the Pearl SensiTones are back! The previous "SensiTone Elite" series was introduced in 2006. 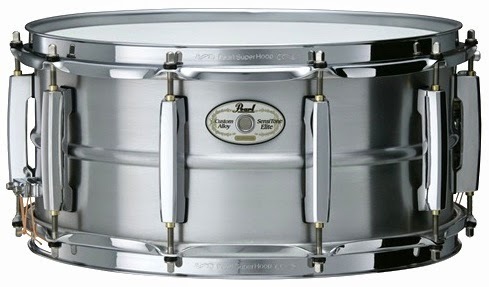 In 2011, Pearl discontinued the stainless steel, bronze, and aluminum shells, leaving only the brass and steel options in production. Since mid-2013, aluminum SensiTone Elites in the 6.5x14 size have been nearly impossible to find new, an issue compounded by spotty availability on the used market. 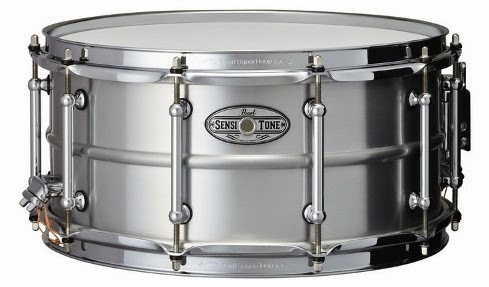 Several music stores continue to carry inventory of the aluminum SensiTone Elite in 5x14. So far, the new SensiTones seem to be scarce as well. The online music stores I checked show availability as "wait times vary" for drums in the new SensiTone line. However, this is likely to change as orders start flowing in! New SensiTones are available in steel, brass (with black nickel finish), seamless aluminum, Premium brass (with patina finish), Premium phosphor bronze, Premium maple, and Premium African Mahogany. All are available in 5x14 and 6.5x14 sizes, except the Premium African Mahogany, which is only available in 5x15. Prices range from $299 for the steel in 14x5 to $629 for the Premium brass and Premium phosphor bronze models in 6.5x14. The most obvious change with the new SensiTones is that they now sport tube lugs, an upgrade that had been on many drummers' wish lists. While the previous SensiTone Elites' bridge lugs were fairly slim in profile, the new tube lugs do provide an even more lightweight and classic look. The Premium models are equipped with Pearl's ARL modified tube lug that appears to be a tube-bridge lug hybrid. The second major change involves the snare throw-off. The previous generation SensiTone Elite utilized Pearl's SR-017 side-lever throw, while the reintroduced SensiTones are equipped with Pearl's SR-150 Gladstone-style throw, complete with a Click-Lock feature to lock the snare lever and tension adjuster where you set it. Both generations include Pearl's 2.3mm Super Hoop II hoops, 20-strand UltraSound snares, and Remo Ambassador heads. As with all aluminum-shelled snare drums, the aluminum version of the SensiTone Elite has been subjected to never-ending comparisons with the venerable Ludwig Supraphonics and Acrolites. The SensiTone Elite held its own in these comparisons, especially when price was a factor. The fact that 6.5x14 SensiTone Elite aluminum snares are difficult to find on the used market today indicates that drummers are hanging onto these drums. And, the new SensiTone aluminum model, with its lower-mass tube lugs, improved throw, and attractive price point, should prove to be an even stronger alternative to the aluminum Ludwigs. If you are in the market for a quality snare at a mid-level price, Pearl's new SensiTone line is worth a look. And, as drummers upgrade to the new SensiTone drums, I expect to see more previous-generation SensiTone Elites on the used market. That's a win-win for the budget-conscious drummer!